Kate Beckinsale looked stunning (seriously, the woman is always perfection) in this silver Zuhair Murad gown. I love the art deco design in the detailing, and the fit-n-flare shape. When Amber Heard took the stage tonight, I couldn't take my eyes off of her and those legs, goodness gracious! She looked like a powerhouse in this beautiful, asymmetrical Versace gown. I looove Olivia Wilde pregnant! She is absolutely radiant, and I love that she wore this emerald green, form-fitting gown by Gucci to accentuate her lovely shape! Loved this Prabal Gurung piece on the runway at NYFW last spring, and I love it perhaps even more on Zoe Saldana! 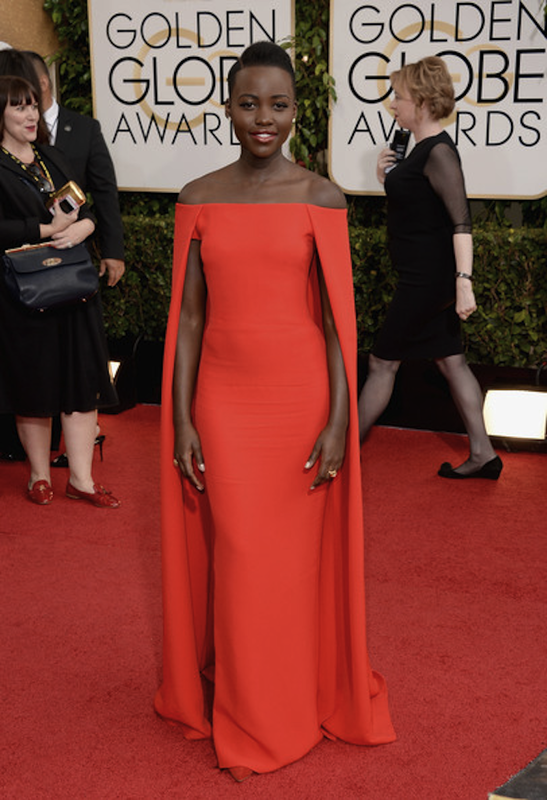 What a gorgeous pop of color and serious fashion moment for the lovely Lupita Nyong'o. She was a showstopper in this red, caped Ralph Lauren gown! Sarah Paulson looked delicate and lovely in this lace Marchesa dress. I really love this Rani Zakhem piece on Kaley Cuoco. It's a risk, and it took my breath away. The vintage-looking, artistic, pastel floral print was divine, and I love the corset bodice. Simple, elegant, and beautiful: Taylor Schilling looks like a classic starlet in this emerald green Thakoon dress. Finally, some drama!!! Sofia Vergara OWNED the red carpet in this stunning, black Zac Posen gown. I love the fitted bodice and the full flowing skirt. The best part? Her statement turquoise necklace by Lorraine Schwartz. I'm in fashion heaven here. It's almost annoying how gorgeous of a couple they are, but my eyes were glued to Jenna Dewan-Tatum in this beautiful, black & white Roberto Cavalli dress! Alright BBs, what do you think? Anyone you would have nominated for best or worst dressed? I'd love to hear from you! !